In September the register showed just over 36,200 EU nurses and midwives – over 2,700 less than a year before. 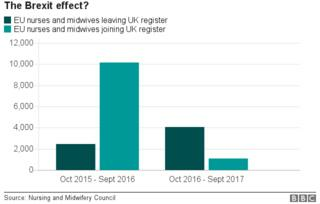 Rises in the numbers of nurses and midwives leaving the register was seen among all types of staff – those trained in the UK, in the EU and in the rest of the world. There were just under 690,000 nurses and midwives registered to work in the UK in September – over 1,600 less than there were the year before. Research by the Royal College of Nursing (RCN) said there were over 40,000 unfilled vacancies – one in nine posts. The NMC said the rising numbers leaving the profession across the board was “worrying” and needed to be responded to. RCN general secretary Janet Davies said it was “no surprise” EU nurses were also turning their backs on the UK given what was happening with Brexit. But the Department of Health played down the significance of the overall drop, pointing out it represented a “mere” 0.2% fall in the numbers registered to work. A spokeswoman said the number of training places would increase by 25% in the coming years and that ministers had been “very clear” that EU nationals would remain a valued part of the workforce after Brexit.